The rescue of more than 600 migrants off Libya on Saturday by a flotilla of EU ships took the weekly total to at least 13,000, Italian authorities say. The rescues were the latest by a patrol of Italian, German and Irish ships operating in the Mediterranean. It is now the main migration route since an EU-Turkey deal curbed numbers sailing to Greece. 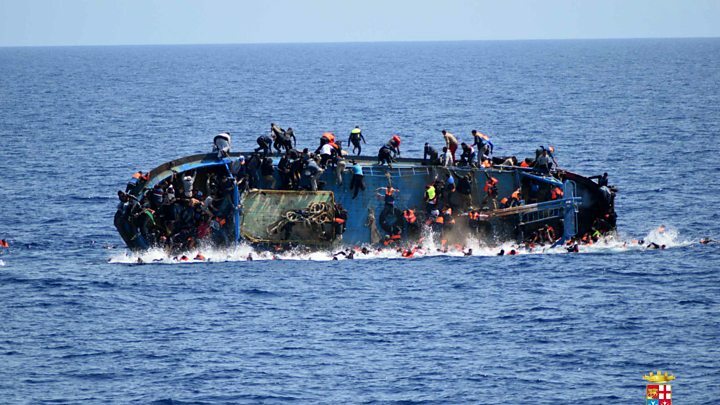 An Irish vessel saved 123 migrants from a people's smugglers' rubber dinghy on Saturday, the Irish military said, while the Italian coastguard said a German ship had carried out four rescue operations from similar unseaworthy vessels. Meanwhile, about 4,000 migrants plucked from the sea earlier in the week arrived in Italy on Saturday. Many others are known to have drowned. In one dramatic operation caught on camera by Italian rescuers on Wednesday, a migrant boat overturned after spotting a patrol boat. 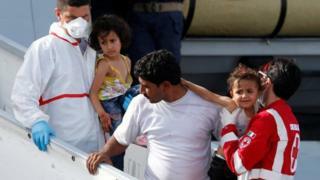 The Italian navy rescued 562 people, while five died. The same patrol boat rescued a further 108 migrants in another incident later that day. On Tuesday, another 3,000 people were rescued from smugglers' boats. Most migrants are fleeing conflict and poverty in Africa and the Middle East. Under a European Union plan, tens of thousands of those rescued at sea were supposed to be relocated to other EU countries from Italy and Greece, where most land. However anti-migrant sentiment in other countries have meant that few of have actually been transferred.